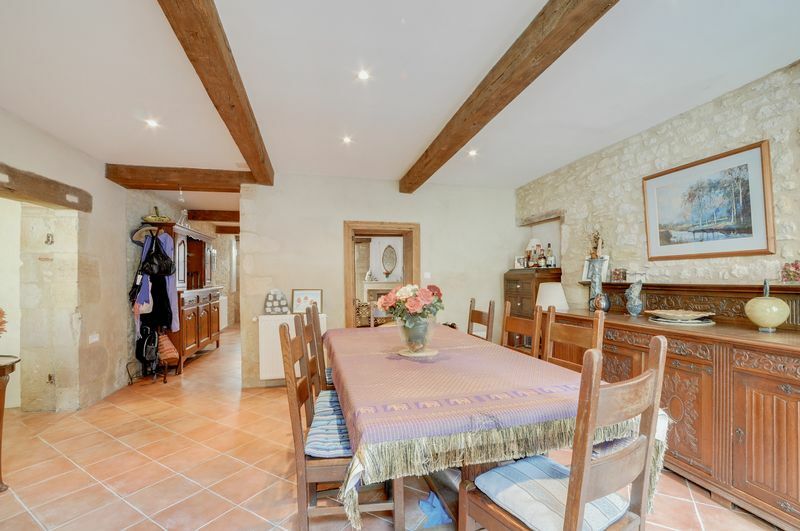 Old stone sink or "evier"
A SUBSTANTIAL DOUBLE FRONTED 4-BEDROOM STONE TOWNHOUSE with a lovely PRIVATE COURTYARD situated IN THE MEDIEVAL CENTRE OF HISTORIC DURAS, Southwest France. An adjoining garage and one bedroom apartment with income potential are also available by separate negotiation. All bedrooms are good sized doubles, three to the first floor sharing a large shower room (space /plumbing for a bath) and one on the ground floor next to a second shower room. Most doors and windows are hardwood double glazing, and the house has been completely renovated by the current owner using local craftsmen. Heating is via modern radiators serviced by an oil-fired boiler located in the cellar. Stairs from the first floor landing lead to a large attic space which could easily be converted to additional accommodation if required (subject to planning permission). The generous courtyard has space for a dining table and chairs seating 10 people, a stone well in the centre and a rotary washing line. 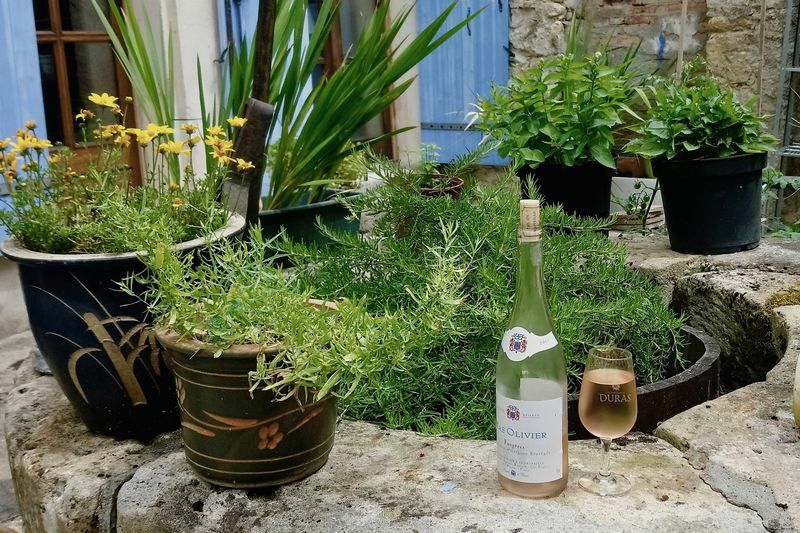 All the amenities of Duras are on your doorstep including weekly markets on Monday mornings throughout the year and night markets on Thursdays in the peak summer months. Other weekly markets are available in the surrounding towns (including Monsegur 10km, Eymet 22km, Miramont-de-Guyenne 18km, and Sainte-Foy-la-Grande 22km). 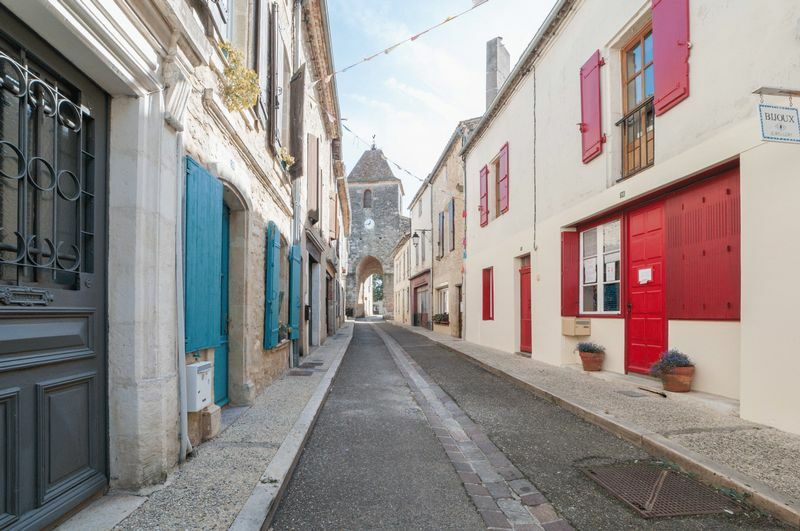 There are several cafe-bars and restaurants within a few hundred yards, as well as shops, a small supermarket, banks, two bakeries, a church, chemist, doctor, several estate agents, and the beautiful chateau. There is a larger supermarket on the edge of town with a broad selection of local produce - this is no more than a 10 minute level walk from the house. There are tennis courts for hire in Duras, Levignac de Guyenne (6km) and Saint Sernin (8km), and hot air balloon rides take off near the chateau when weather conditions permit. Canoes can be hired on the river Dropt in Allemans-du-Dropt (12 km) and the river Dordogne (Sainte-Foy-la-Grande, 22km). Various golf courses are within half an hour drive. There is a public indoor swimming pool in Marmande (24km), outdoor pools at Monsegur (10km) and Miramont-de-Guyenne (18km), and various swimming lakes and river beaches within 25km. The park surrounding Duras Chateau has various public picnic areas and a playground. The countryside surrounding Duras is very picturesque and lends itself to long walks or cycle rides - local accompanied walks are free to join during the summer months. A number of good quality vineyards are within easy reach and most offer wine tasting throughout the year. Not far from the foot of Duras Chateau is a locally renowned artisan chocolatier with a wide selection of chocolates, prunes, preserves and other products. In addition to wine and prunes, other specialties of the local area include fois gras, duck products, hazelnuts, various cheeses, jams and preserves. These can be found in the local markets as well as at individual farm producers. French Properties Direct markets property which is for sale by the owner privately. There is no estate agency commission to pay us if you buy this property following an introduction by us. The property information and photographs we have published have been provided by the property owners. We publish them in good faith, but cannot warrant their accuracy, completeness or legality. Running under bedroom 4, the kitchen and dining room is a full height cellar entered via a very solid trap door in Bedroom 4. The ceiling has original stone vaulting under the kitchen, with replacement suspended concrete flooring below bedroom 4 and the dining room. The cellar houses the central heating / hot water boiler and a large oil storage tank. The tank is filled using a long hose on the delivery trucks via the garage and a grate in the courtyard, so no need to pass through the house. All floors on this level were replaced during renovations and have been tiled by a local artisan on the same “diagonal” throughout giving a pleasing flow to the rooms. 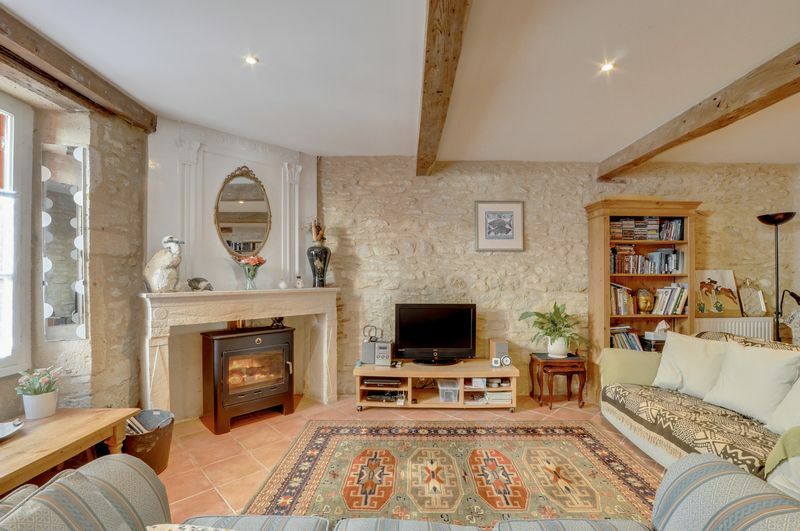 Entered from rue Cesar Jauffret by a lovely old door, the lounge is a substantial room with exposed stone walls, corner stone fireplace with original ornate plaster-work over the mantle, and a wood burning stove (takes 50cm logs). There are two radiators and doors to the dining room and bedroom 4 / study. Ceiling spotlights add a touch of modern convenience between the exposed original beams. Doorways to the dining room and bedroom 4 / study retain their original wood panelling. A bright and sunny room with double glazed French doors and a second double glazed hardwood door to the courtyard. Walls are a mixture of pointed stone and render over stone. An original wooden staircase rises to the first floor, passing a medieval stone sink discovered in the external wall during renovations. Ceilings have spotlights and exposed beams. There are two radiators. 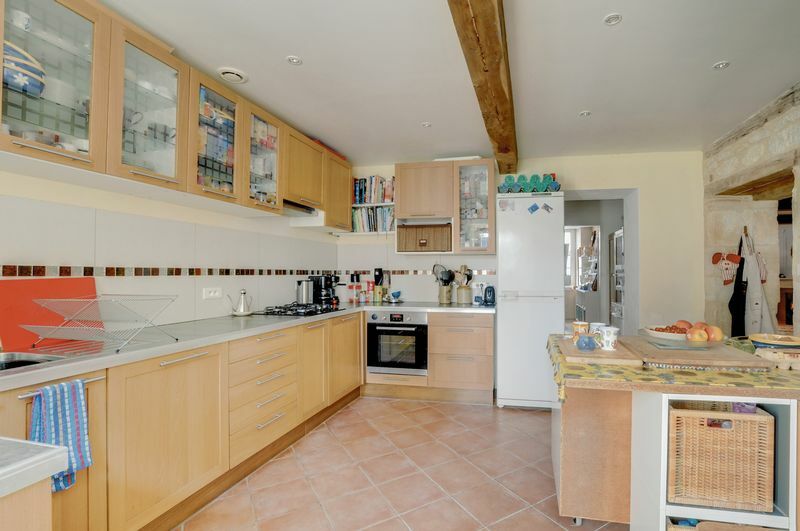 Spacious fitted kitchen with a good range of wall and floor units in an oak finish. There is a gas hob (bottled gas) and electric fan oven, integrated dishwasher, space for a free-standing fridge/freezer and plumbing for a washing machine. There is ample space for a kitchen table or island. Double glazed window and door lead to the courtyard. Radiator. Linking Bedroom 4 /study and the kitchen is a corridor with space for storage and a tumble dryer (condenser type). This corridor also has a door into the ground floor shower room. 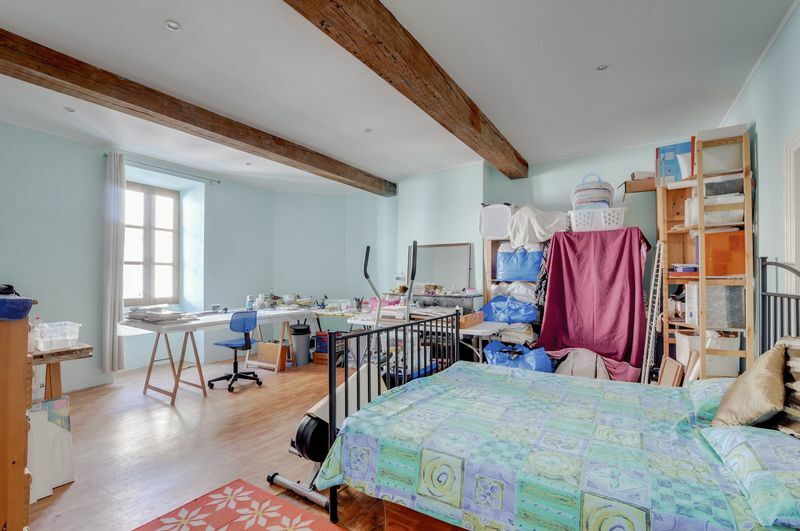 Currently used as a workroom and study, this room can also be used as a downstairs bedroom with convenient access to the ground floor shower room, making it ideal for anyone with difficulty climbing stairs and could also be used as a B&B room. There is an external door directly onto rue Cesar Jauffret and internal doors to the lounge and kitchen corridor. A substantial trap-door leads down to the cellar and there is also a central heating radiator. 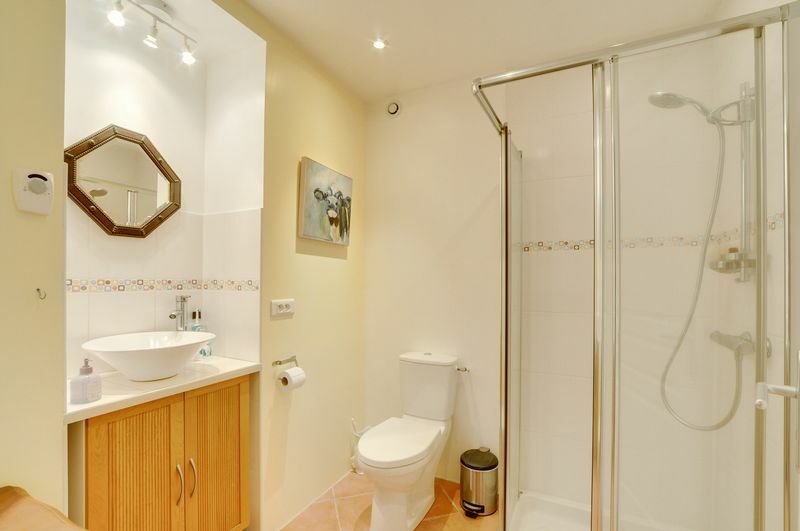 Entered from the kitchen corridor, this room has a corner shower cubicle with thermostatic shower bar, a recessed sink with cupboard below, a low-level WC and a towel rail connected to the central heating system. 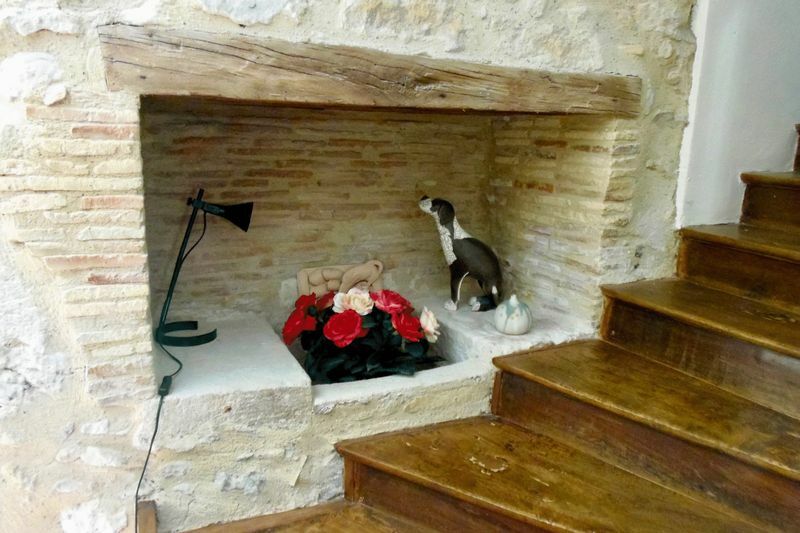 Lovely original wooden stairs rise to a light and open landing area which has painted original floorboards. A window at the top of the stairs looks out over the courtyard towards the garage. From this L-shaped landing are doors to the attic, bathroom, and three double bedrooms. A good sized room with suspended toilet, glass sink over a double fronted cupboard, and a recessed shower cubicle 120 x 80cm with thermostatic shower bar. 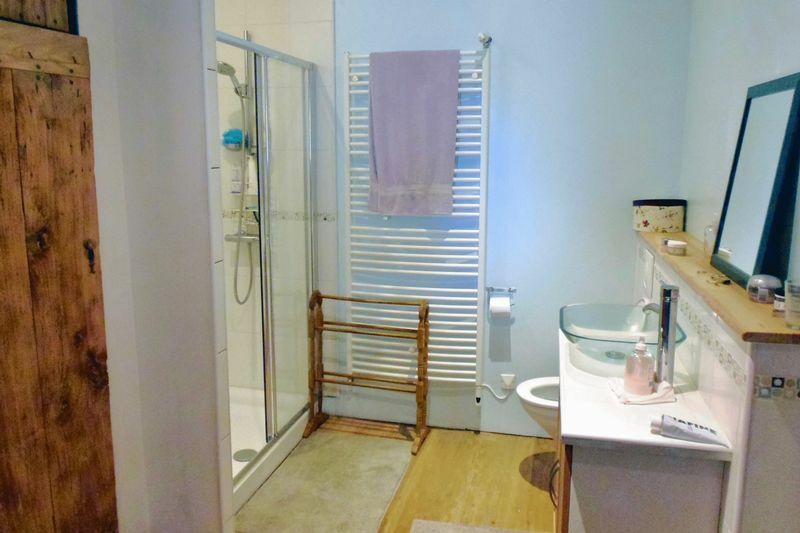 The towel rail is connected to the central heating system. To one side there is an under stairs cupboard with original wooden boarding exposed. An internal window borrows light from the landing above an area intended for a bath (plumbing is already present in the under stairs cupboard although no bath has been fitted by the current owner). 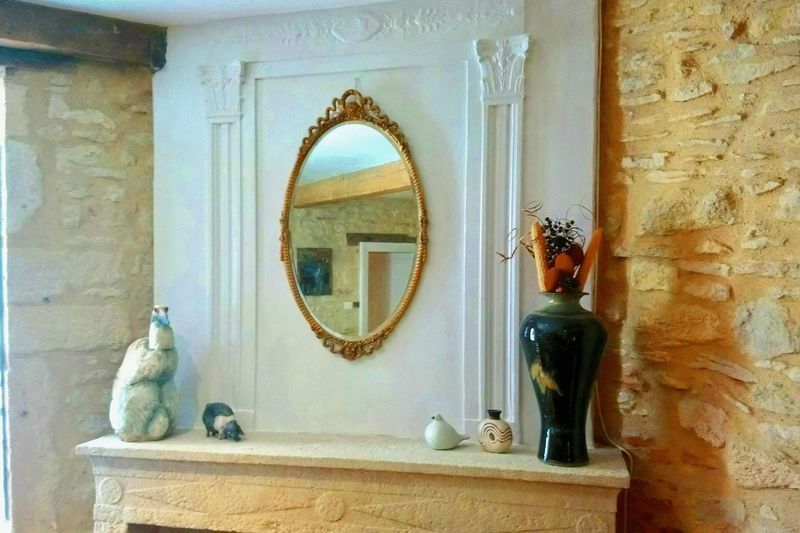 This bedroom has a marble fire surround, an open fireplace with metal grill to close when not in use (chimney is currently capped), and an ornate plaster over-mantle. Original floor-to-ceiling dark wood doors either side of the fireplace enclose two useful wardrobe spaces, one side fitted with a hanging rail and the other with free-standing shelving. The double glazed hardwood window looks out onto the courtyard below. Radiator. A very large bedroom situated over the lounge, this room has a marble fire surround, an open fireplace with metal grill to close when not in use (chimney is currently capped). 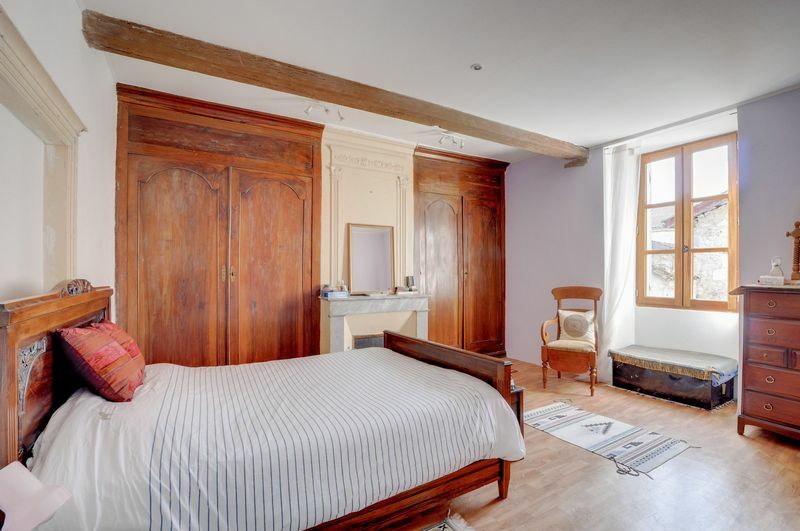 There are two radiators and a hardwood double glazed window overlooking rue Cesar Jauffret. There is ample space in this bedroom to install an en-suite bathroom should this be required. 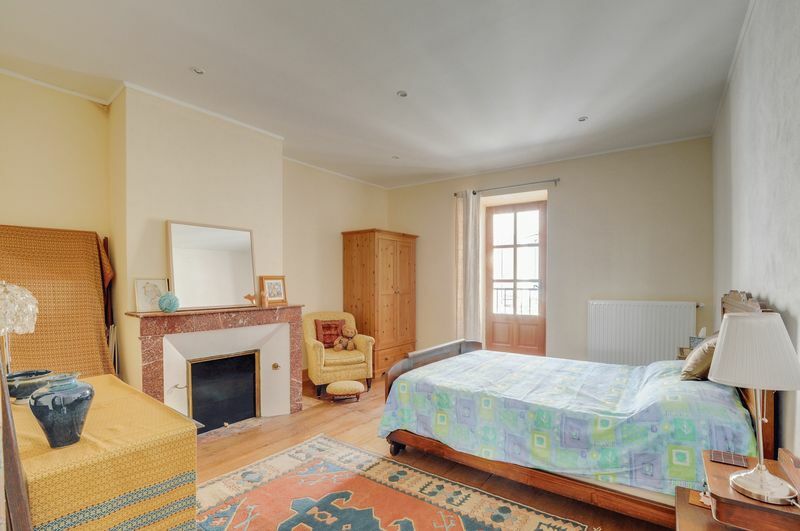 Another good sized double bedroom with a double glazed door and Juliet balcony overlooking rue Cesar Jauffret. 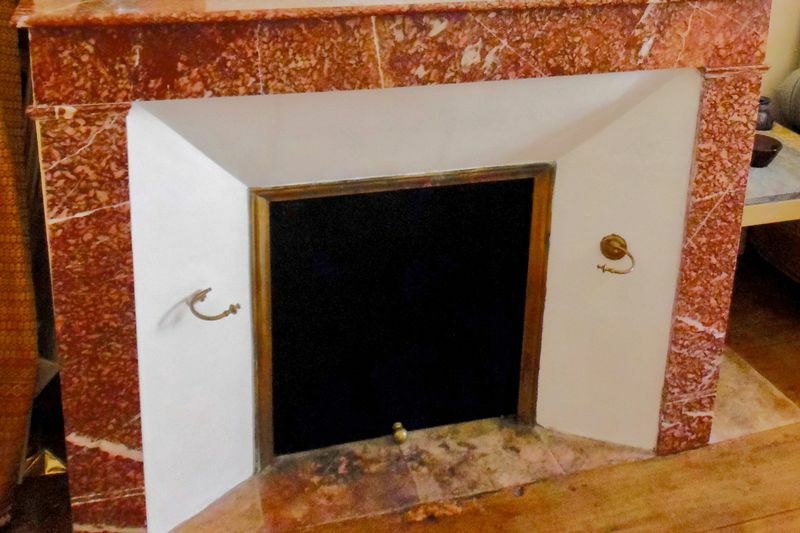 This room also has a marble fire surround, an open fireplace with metal grill to close when not in use (chimney is currently capped), and a radiator. Approached by rustic stairs rising from the first floor landing, there is a large boarded attic space with two Velux windows, power and light. The height of this space would lend itself to conversion to additional accommodation if required (subject to planning permission). 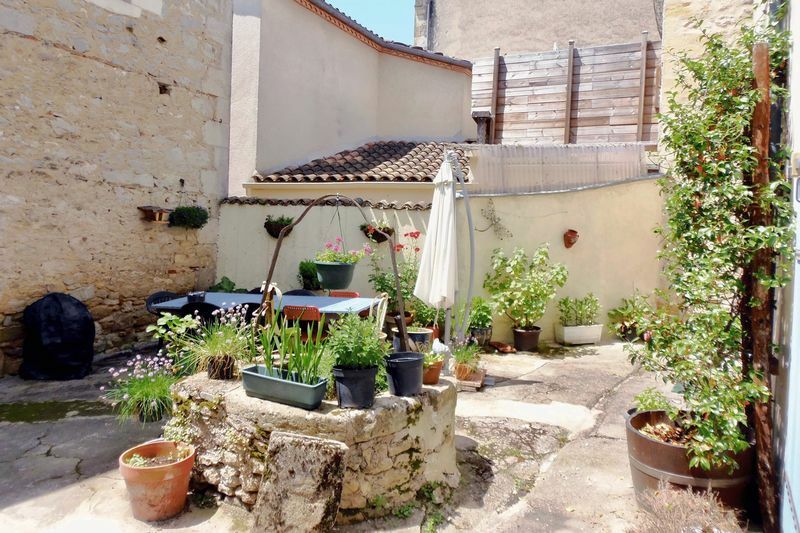 The house benefits from a delightful courtyard which is surprisingly private given the central location of the property. A lovely stone well is in the centre, currently used to showcase herbs and flowers, but it could be opened up if required. There is ample space for a large table for summer parties – the current table seats 8 to 10 people, as well as an area for a rotary clothes line. Oil fired central heating and hot water system with radiators throughout the house. A very short, level walk away. 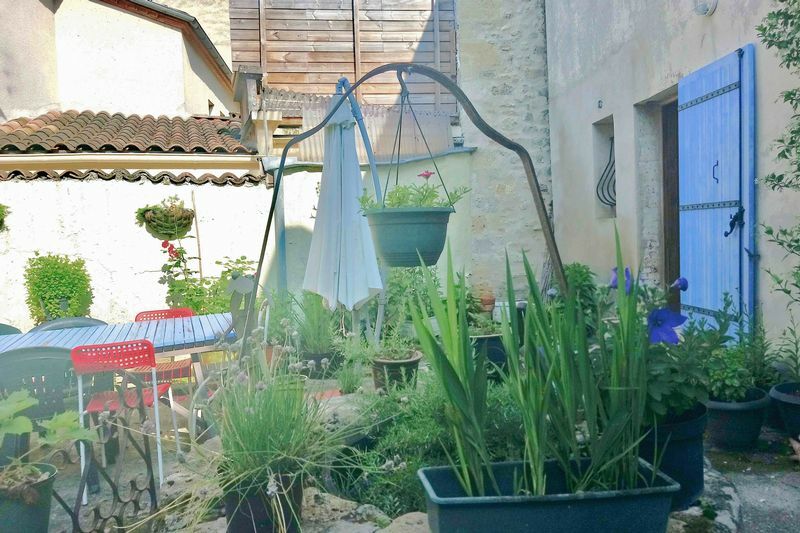 The house and apartment are situated in the heart of medieval Duras, a lively village (or small town) with bars, restaurants, shops, a bank, estate agents, insurance companies, butchers and other facilities. There is a small supermarket in the main square as well as a larger Carrefour Contact supermarket a 5 to 10 minute walk away. There is always something going on in the village – much is organised by the Tourist office and local council (Mairie) as well as the very active Commerçants Association. 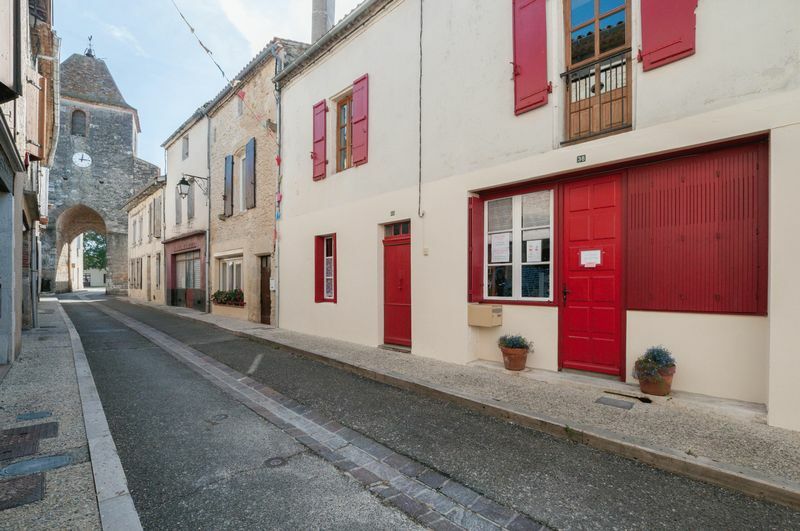 There is a one bedroom apartment with its own entrance from rue Chavassier above the garage, separated from the house by the courtyard so maintaining the privacy of the main house. The apartment was created in 2000/1 with all new floors, windows, electrics and plumbing. A comfortable space with a vaulted ceiling in the kitchen/living area, the apartment has the potential to generate an income throughout the year. The garage is more than large enough for a car in addition to storage / workshop potential. 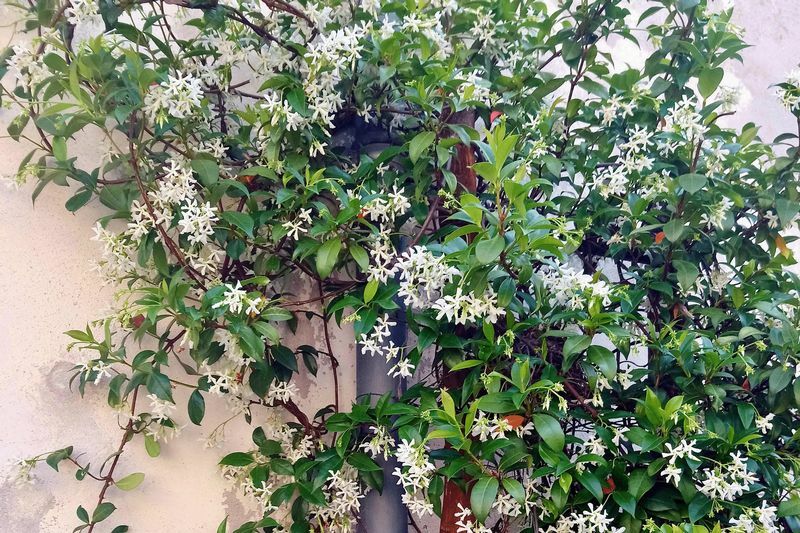 It is currently used for wood storage for the wood burners in the house and apartment, general storage, and houses the electric water heater and electric meter that serve the apartment.